Description: Now is the time to decorate your mantles, mailboxes, and entryways to set the mood for the holidays. So decorate with fresh greenery, botanical materials (i.e. pine cones, acorns, grasses, etc.) and ribbon tree toppers from Aldridge Gardens! 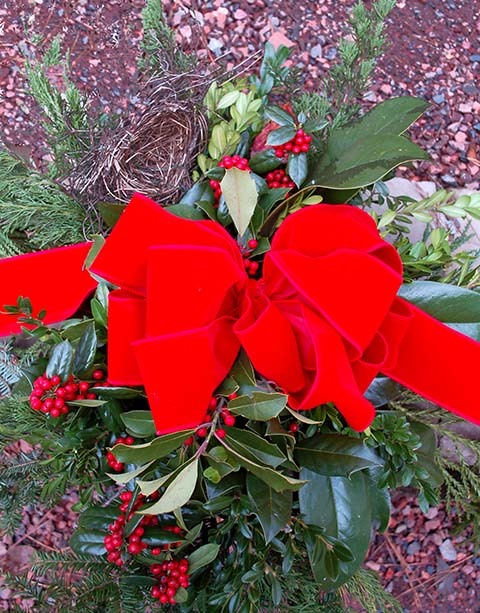 Get greenery for wreaths, garlands, and other holiday decorations! And as long as you’re here and getting into the spirit of the season, visit Roots for ornaments, Christmas decorations and gifts. Follow the arbor-covered path to display areas showcasing plants, pots and containers, books, home and garden accessories, and more. Roots is open Monday through Friday, 10:00 a.m. to 3:00 p.m.